ear tech fans, today we can define what have prepared for you as something that was worth the waiting. Digital Magnet is proud to introduce to you one of the most anticipated devices in 2012, the successor of the original Galaxy Note, which was Samsung’s huge smartphone success of 2011. The Galaxy Note 2 looks very similar to its predecessor with the only difference that it is a bigger device as the screen size has increased. And if we need to compare and distinct them at the same time we would say “the same slim body only holding a larger screen”. The phone dimensions are 80.5mm width by 151.1mm height and 9.4mm thickness. Those increased numbers result in the 183g of weight which places the smartphone in the above-the-average category. Your ultimate viewing experience is provided by the large 5.5’’ HD Super AMOLED display at the screen ratio of 16:9 and 16M colors. The resolution on this huge display is 1280×720 pixels which means 265ppi. Those specifications provide bright display with rich colors. Just below the screen you will find the actual home button and just above it, on the bottom line of the display there are three touch-sensitive keys. The screen is protected by a Corning Gorilla Glass 2. Now slim also means faster. The 1.6GHz quad-core Cortex-A9 processor runs smoothly and responds quickly to all of your desires and commands. The performance is additionally boosted by the the 2GB of RAM.The Samsung Galaxy Note 2 provides 16/32/64GB of user storage but if you need to expand it further there is a micro SD slot provided that can expand the storage on your Galaxy Note 2 to hold up to 128 GB of content. The main camera is rear-facing 8MP one with autofocus, LED flash and BSI sensor for better low-light images and panorama mode. It captures video in FullHD at 1080p. The second front-facing camera is 1.9MP VT camera that also has BSI sensor and provides a wonderful way to share with everyone what you are up to via video calls. As far as functionality goes the Note 2 expands it even further.Now the Galaxy note 2 is more flexible than ever as it features the Multi Windows function, the new Android 4.1 Jelly Bean platform allows you to easily do multiple tasks on the same screen at the same time without having to switch between different screens. The Air View control is the ultimate browsing navigator as it gives you quick access to all of your picture content without having to open and close hundreds of folders. 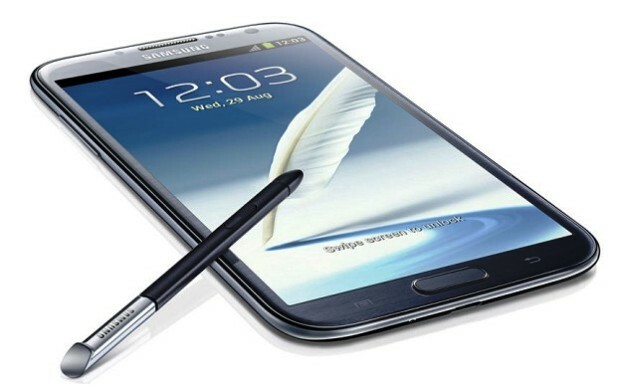 Samsung Galaxy Note 2 features a Quick Command that to literally write down the command what you would like the phone to perform. You can do this with the help of the S pen stylus that Samsung has featured on the machine. In the left periphery line we find a volume controller, on the top corner there is an 3.5mm audio jack and on the right side you will find the power key. On the bottom edge Samsung have provided micro USB port v 2.0 that also acts like a charging port. The connectivity abilities of this device also include NFC. The 3100mAh Li-ion battery provides around 35 hours of talk time and around 980hours in stand-by.